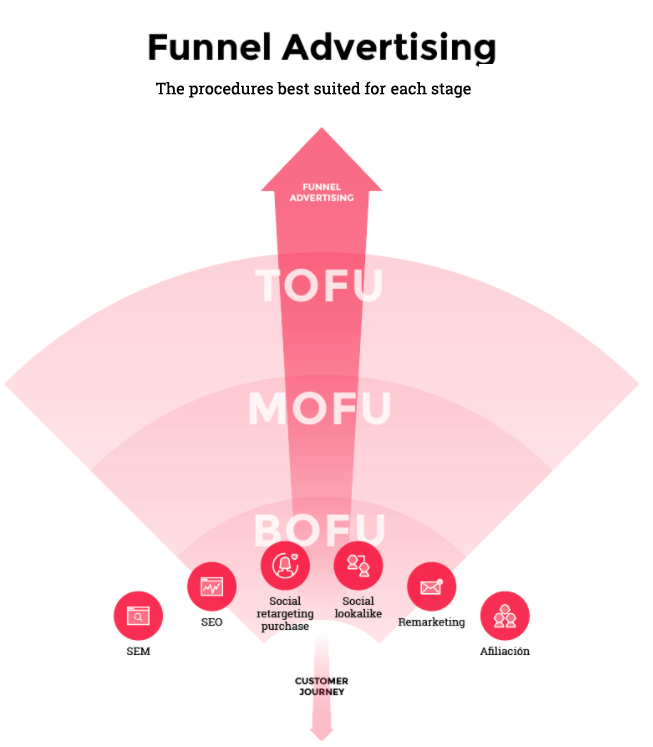 The BOFU stage is the lowest part of the conversion funnel and is comprised of users who have already considered all of their available options within the market segment and still remain interested in us. However, we could also find ourselves with consumers who don’t yet know us but remain confident in their purchase or short-term hiring. In the BOFU stage, within the Funnel Advertising Methodology, we begin to make ourselves known to consumers by way of self-promotion. Due to the close proximity to final conversion, this provides a much higher chance of converting the client. SEO. SEO (Search Engine Optimization) is the marketing technique used to better a company’s webpage with the goal to ultimately better the site’s organic standing in an internet search for any given search engine. Non-branded SEM. SEM (Search Engine Marketing) is the marketing technique which allows us to publicize ourselves in the search results of a search engine, thus raising our visibility online by paying for the ads (ads are paid per click). Overall, non-branded SEM is characterized by not specifying the brands of products to be sold; these ads are much more general. Branded SEM. Branded SEM is odd in that it is SEM that makes reference to specific brands of an advertised product. Therefore, this type of advertising focuses only on the users who are looking for a concrete product. Social Retargeting – Purchase (BOFU Stage). In Social Retargeting, one tries to make an impact via social medias on users whom have previously visited our website/used our app. Social Lookalike. Working with similar audiences (e.g. Facebook and Instagram) allows us to impact/act upon our users with a very well-defined profile, similar to those who are already familiar with us. Email Remarketing. Email Remarketing consists of detecting when a subscriber visits our website and remembering what actions he/she has taken so that, afterwards, we can send them a personalized email based on what they had been doing on the website. Remarketing or Retargeting of Client Acquisition (purchase has been made). Remarketing looks to impact users who have previously visited our website. Specifically speaking, Remarketing in the BOFU stage is focused on people whom have already made a purchase on our website. Affiliation in Comparators. Affiliation campaigns in Comparators consist of appearing on websites that compare prices/offers within the same category of the advertised product. Affiliation – Cash-back. This consists of partnering with a website or company, publishing their ads on our website and earning a commission for each click that they get. For Cash-back, it is not just the website/company that gets a commission, but users also get to partake in the commissions in the form of money, discounts, etc.… In this way, the partnered company/website assures a large number of visits.